After more than a century of population decline resulting from habitat loss, and competition from invasive species, Brook Trout are starting to feel the heat from climate change as well. Fortunately, partners from all sectors are joining forces to tackle “the big three” with the right tools, using the best available science supported by the North Atlantic Landscape Conservation Cooperative, the Appalachian Landscape Conservation Cooperative, the EBTJV, and others. For anglers, citizens, and scientists alike, the Eastern brook trout is more than just a fish; it’s an icon. It’s a prized catch, the official fish of nine states, and an aquatic “canary in the coal mine.” Because brook trout depend upon clean, cold water habitat, a lack of brook trout is a good indicator that something’s amiss. What lies beneath? 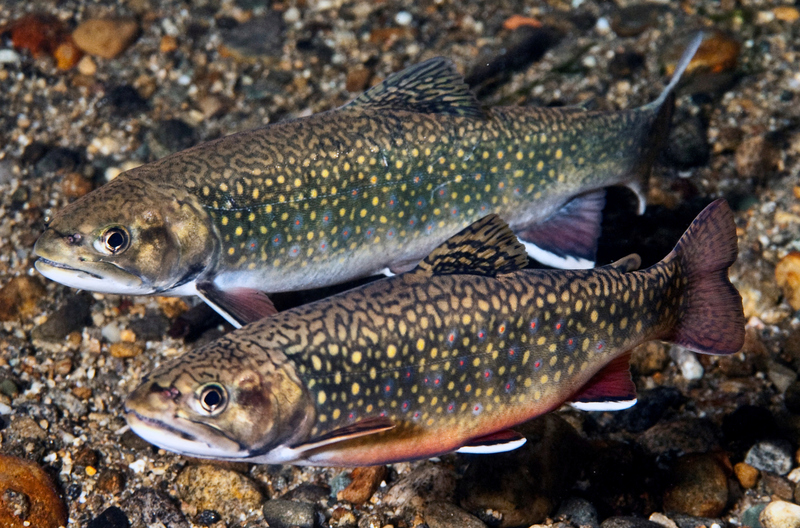 With sophisticated new modeling tools that take climate change into account, resource managers can better protect cold water habitat that eastern brook trout and other species depend upon. Well, something’s amiss alright. After more than a century of population decline resulting from habitat loss, and competition from invasive species, brook trout are starting to feel the heat from climate change as well. 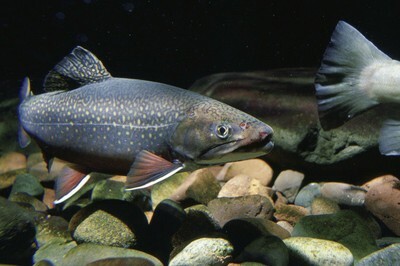 That means if you have pristine habitat with no invasive species, but the water temperature is rising: No brook trout. Or if the water is ice cold and there are no exotic competitors, but the adjacent land is being converted into a theme park: No brook trout. Fortunately, partners from all sectors are joining forces to tackle “the big three” with the right tools, using the best available science supported by the North Atlantic Landscape Conservation Cooperative, the Appalachian Landscape Conservation Cooperative, the EBTJV, and others. “These new models that are coming out take into account these complex interactions to help partnerships direct their efforts, and invest their first dollar in places where they are mostly likely to be most successful,” said Hudy. Seemingly minor changes in temperature can have major ripple effects for populations of cold-water dependent species like eastern brook trout. Given the implications for freshwater resources from warming associated with climate change, resource managers need to act strategically to mitigate the impacts on aquatic communities. Researchers from the University of Massachusetts Amherst and the U.S. Forest Service developed a modeling approach that combines data on land cover, elevation, and aspect to help identify streams and rivers with the potential to maintain cold water in the face of rising air temperature, but lack adequate tree cover to shade water from increasing solar radiation. The online web-mapping tool allows resource managers to locate the best places to plant trees along stream and river banks within their jurisdictions to maximize shading over critical cold-water habitat throughout their range. Scientists estimate that brook trout have been extirpated from 60 percent of their historic habitat in the Chesapeake Bay watershed, thanks to competition from invasive species and human development. With climate change posing increasing threats to habitat, it is more important than ever to preserve strongholds for these fish within this watershed. North Atlantic LCC-funded environmental consulting firm Downstream Strategieshas developed a model and accompanying assessment for the Chesapeake Bay watershed that predicts brook trout occupancy, evaluates habitat quality, quantifies how human use and climate change are likely to impact both, and identifies conservation priorities at multiple scales. The goal is to provide a tool for practitioners to identify ground-level restoration projects that will have a positive ripple effect for brook trout populations across the entire watershed. Assess conservation success within the context of future climate regimes. Headwater streams are the primary habitat of eastern brook trout, and thus the best focus for conservation and restoration efforts to ensure a future for this species. But in order to prioritize which headwater streams to protect, practitioners need to know which streams can continue to offer the key conditions necessary for sustaining brook trout in the face of climate and land-use change. A team of scientists from US Geological Survey and the University of Massachusetts Amherst is developing a decision-support tool for prioritizing areas for restoration and protection efforts, and comparing alternative management strategies by predicting changes in stream temperature, flow, and brook trout occupancy based on how climate change and development are expected to impact air temperature, precipitation, and forest cover.